This etching was made by Domingo Muñoz (1850-1935) who was a Spanish painter and illustrator. The drawing was published on 22nd January 1879 in the newspaper “La Ilustración Española y Americana”. The article, where the print was published, describes the funeral of General Espartero who was buried in the church Santa María La Redonda. Nowadays the original drawing is in the Library of La Rioja, in Logroño. This picture represents a famous street of Logroño, the Portales Street (which was known in this period as Mercado street) in 1879. Logroño is in the north of the Iberian Peninsula and it is limited by the Ebro river and the foothills of the Iberian System. Due to The Way of Saint James and the Fuero (when Alfonso X gave to Logroño the title of city), Logroño was transformed from a small linear village to a walled city that controlled the Ebro River. The wall defended the city, but over time, it caused the increase of urban density. The 19th century was the last moment in history when the walls had so much importance in Europe in milestones such as the War of Independence, the Carlist War and the disentitlement of the Church properties. 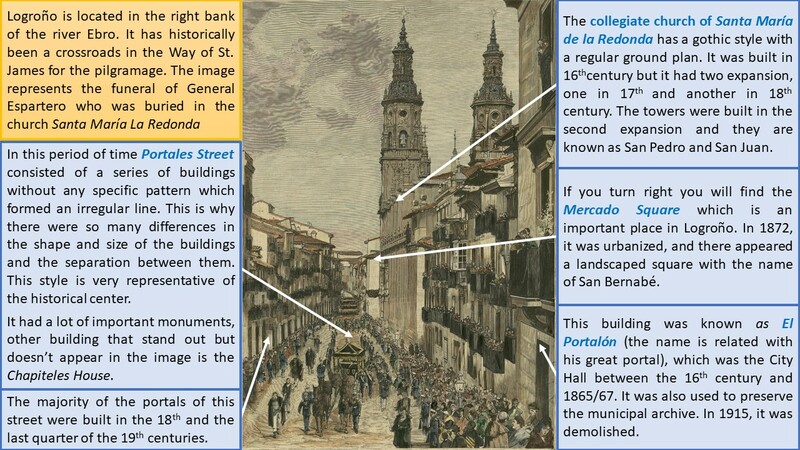 These events influenced in the urban layout and in some important buildings of the city. Since 1833, when Spain was divided into provinces, the Province of Logroño existed (with the capital in the city of the same name) forming part of Castilla la Vieja. When this happened, the population of the city of Logroño doubled his size. This caused the growth of the city and the construction of bridges, wine cellars and other important buildings. As a result of thi, in the 19th century, they built up the Ensanche which downplayed to the historical center. It was organized around El Espolón square and it grew up in every direction except the north. It was also adapted to the orthogonal axis produced by the exits to Zaragoza and Soria. The railway line (1863), which nowadays is the avenue Gran Vía Juan Carlos I and Jorge Vigón, formed the other limit for city expansion. We need to consider that Logroño was surrounded by a wall until 1891, when 126 square meters were demolished to connect the High Street to the Muro de la Penitencia. During the 19th century the city was divided from North to South by the Ancha Street (known now as Sagasta Street) and from East to West by the Portales Street. At the street of this print famous livestock and trade fairs as the Feast of St. Barnabas took place; there were also bullfight festivals and medieval tournaments of jousting. Portales Street had been a place where lived the rich people of Logroño. This was because it was a centric area very near to the most important places such as the market and the church. The importance of the street and their portals made them a typical area to pass through, but also because there were market stallsin the arcades. We can also mention three buildings which stood out, all of them were in the same side of the road: the Chapiteles House, El Portalón and the church Santa María La Redonda. The Chapiteles House was built in the 16th century to be a manor house, until 1862 when it became the Town Hall. This cause a lot of changes in the Portales Street such as the demolition of the post office and other buildings. The previous town hall was El Portalón which was a building located in the same street, with three floors and a coat of arms in the façade. They finally changed the place because it became too small to preserve the municipal archives. The most important church of Logroño is Santa María La Redonda that has got the main portal in the Mercado Square and two lateral doors in the Caballería and Portales Street. At the end of the 12th century, it was a Romanesque church of circular plan. But in the 16th La Redonda was rebuilt with many changes, it was formed by three naves with the same height. In the 17th the temple had an expansion by their head and another one in the 18th by the end of the church. We should mention that in the past the lifestyle of Logroño was very influenced by the monasteries, but it changed with the French occupation (1808-1813) when the main religious buildings were used by the army, other suffered looting and were burned. But also with the Mendizábal disentitlement, many religious buildings were demolished and sold. Thus, this picture shows a modern representation of the bourgeois liberal society of the 19th century. This entry was tagged Logroño. Bookmark the permalink. Very nice analysis. However, I would have included more information in the text, a bit different from the one in the picture. Apart from that, one thing that I find extremely interesting is the fact that you have chosen a picture which actually includes a historical event, as the rest of publication often portray just the city with its common activities. It is curious how you have demonstrated that, eventhough the focus point of the picture is the funeral of General Espartero, there is a lot of importence in its surrounding, the city of Logroño.